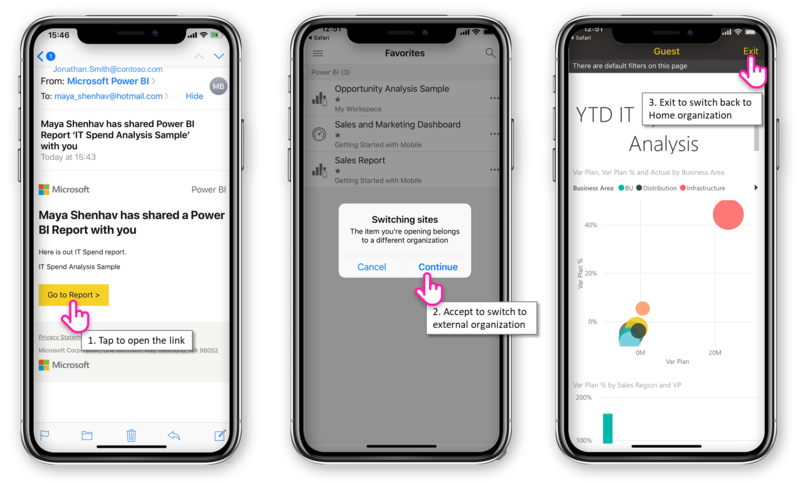 I’m excited to share that now, with the latest Power BI Mobile apps update, mobile users can access Power BI content shared with them from external organizations (also called Power BI B2B). Consider a scenario where an automotive manufacturer working with many diverse suppliers uses Power BI to monitor key supply chain performance metrics by building a BI report. Employees and partners both need access to the report from their office desktop browsers and from their mobile devices. Previously, users belonging to partner organizations could only access this report from their browsers, even when using their mobile phones to view and interact with the report content. 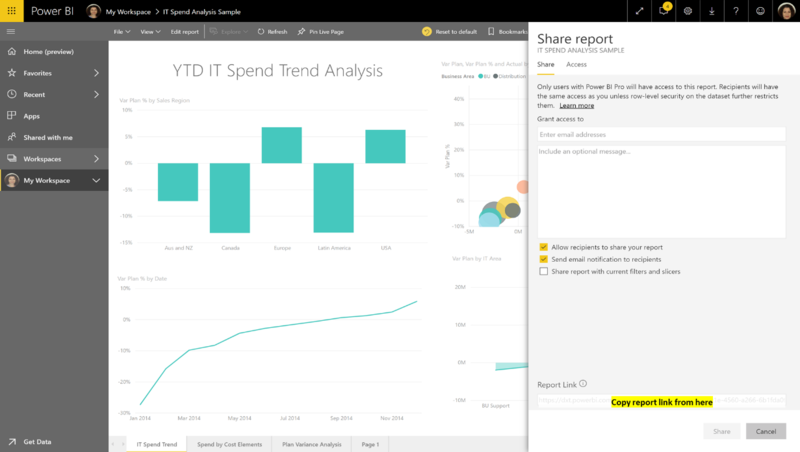 In today’s release, those users can enjoy using Power BI app when accessing the report. When sharing content in Power BI, the recipient of the content (internal and external) receives an email with a link to the shared item. Opening the link from a mobile device with the Power BI app installed, opens the app. And, now, if the item belongs to an organization different than the signed in user’s organization, the app will automatically connect to that organization and open the item. Once connected in the app as guest to external organization, you will have access to all items (reports, dashboards, and apps) shared with you in that organization. Just open the app menu and go to “Shared with me” to view them. Notice the special header indicating that you are connected as guest to external organization. When you’re done viewing the shared content, they can go back to their home organization just by tapping on “Exit”. How to make the app switch to the external organization? Power BI app can connect to a single organization’s repository at a given time. The default connection is to the user’s home organization. So, how can the user connect to the external organization, where he has reports shared with him, then? To access items shared from other organizations, you can use the link in the invitation mail you received when the report was shared with you, as shown above. Another option is to have a link to a report or dashboard copied directly from Power BI. This link must have a CTID param, which tells Power BI app which organization the item belongs to. If the app recognizes that this organization is different than the user’s organization, it will connect to that organization. Select help (?) In the top menu, then select “About Power BI”. Look for the value next to the Tenant URL. This is the organization’s URL you can share with guest users. Using the tenant URL will make the app switch to the external organization, without opening any specific item. Instead, you will land on the “Shared with me” page where you can view all shared content from that organization and select the content to view. Common practice is to embed these links (external organization’s URL or link to a specific item), in a report or dashboard in your home organization. This way you will not need to save the “shared report” email you received from Power BI in order to access external content. Note that, before being able to access any item shared from external organization, the guest user must accept the invitation sent to him (from their mobile device or desktop). The user won’t be able to view any item shared with them before accepting the invitation and becoming guest in that organization. Azure AD B2B guest users is supported in Power BI Mobile apps for iOS and Android. Get Power BI app from the App store and Google play.